The modern on-site facilities include a library, ICT centre, science laboratory, music room, art studio, multi-purpose sports surface and gymnasium. All classrooms are also equipped with interactive whiteboards. 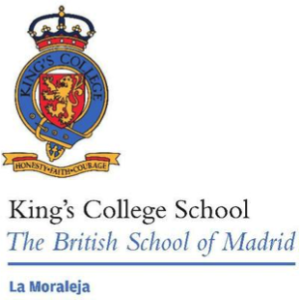 Once students finish Year 11 at King’s College School, La Moraleja, they will progress onto our sister school, King’s College Soto de Viñuelas to study their A Levels in preparation for University admission. Curriculum follows the English National Curriculum leading to (I)GCSE examinations. There are Induction English Classes for children over the age of 7 who need to improve their English while gradually integrating into the mainstream of the school. 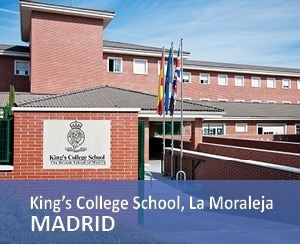 The school has a reputation for high academic standards and excellent examination results with students going on to top universities in Britain, USA and Spain amongst others. An Oxbridge preparatory group works with the most able students to prepare university applications. There is a very experienced Careers and University Entrance Advisory Department for all students. In addition there are many opportunities outside of classroom for students to enrich their learning experiences. For example, through music and sports.